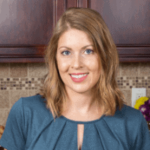 Published: Sep 27, 2018 · Modified: Apr 11, 2019 · By Jen Sobjack · This post may contain affiliate links. 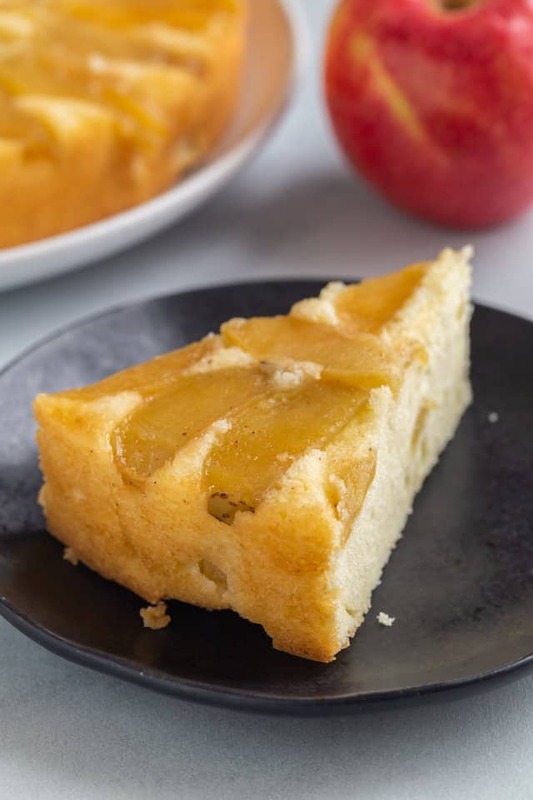 This delicate apple cake is so light and fluffy with bits of chopped apple throughout and topped with slices of fresh apples coated in cinnamon sugar syrup! I used my very old spiced apple upside-down cake recipe as a starting point for today’s apple cake. I make this cake every year and it’s always a huge hit. It’s perfect for apple season when you have plenty of extra apples to use up. Also, the recipe is easy to prepare and the cake freezes well! I cooked the apple slices in syrup so they were softer and had more flavor. I added cinnamon and nutmeg to the syrup to flavor the topping. I left the cake batter plain with the exception of vanilla extract. I used sour cream for a richer, moister cake. I used all white sugar since the sliced apples are coated in a syrup made with brown sugar. I also used less baking powder and a little more salt. The ingredients are all very basic: cake flour, sugar, butter, eggs, sour cream, cinnamon, nutmeg, and loads of apple. It’s so easy and tastes amazing! 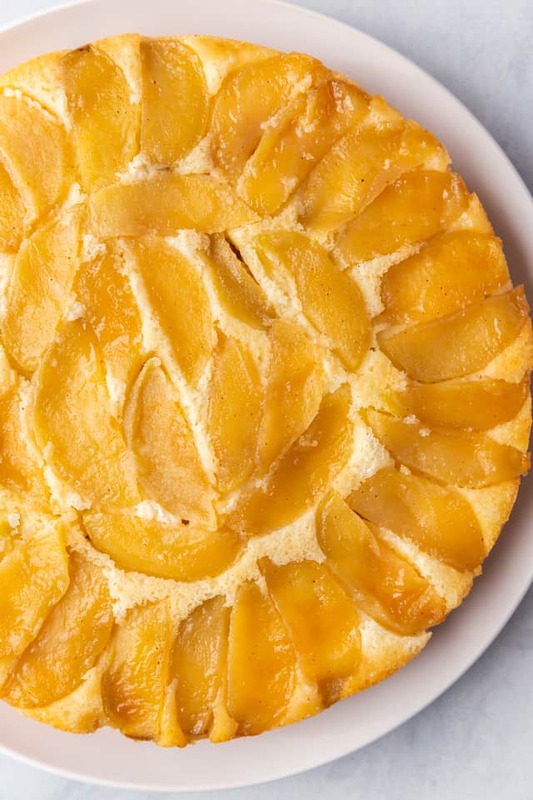 Can you make apple cake with sour cream? This moist apple cake recipe uses sour cream. The sour cream is what gives it a rich flavor and a moist, delicate crumb. 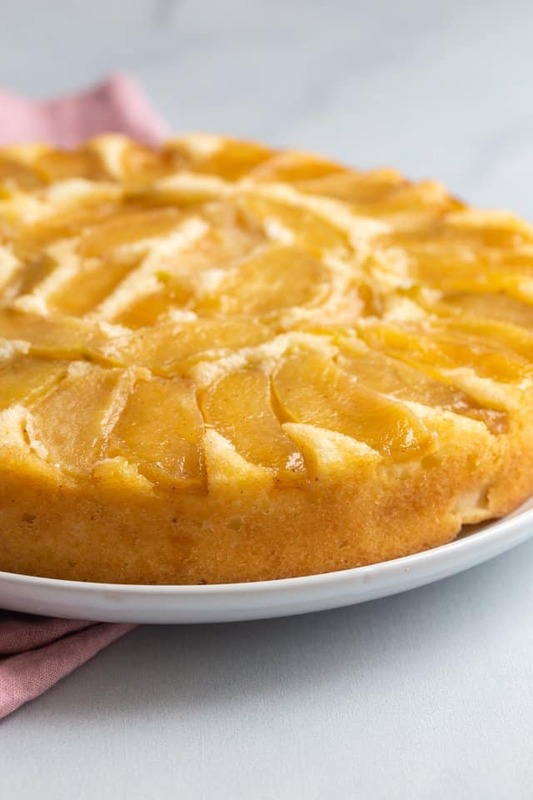 Can apple cake be frozen? 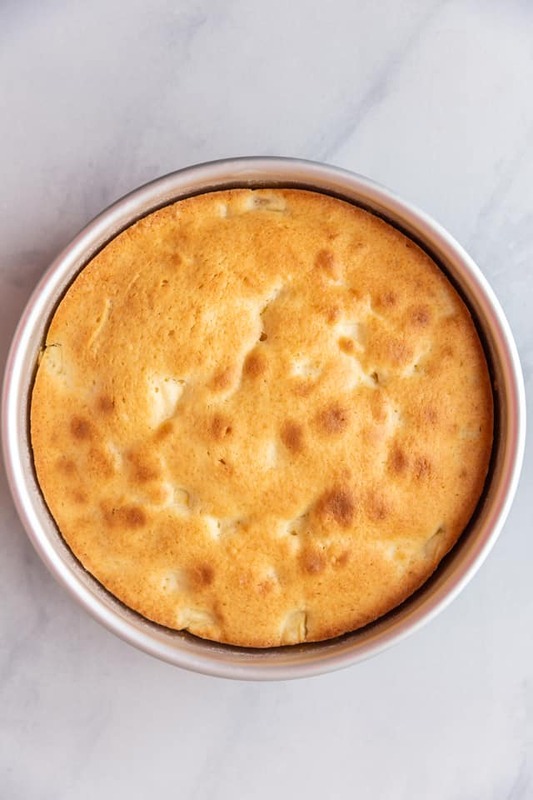 You can freeze this cake for up to 3 months. Once baked, cool it completely then wrap it tightly in plastic wrap. Bring it to room temperature before serving! 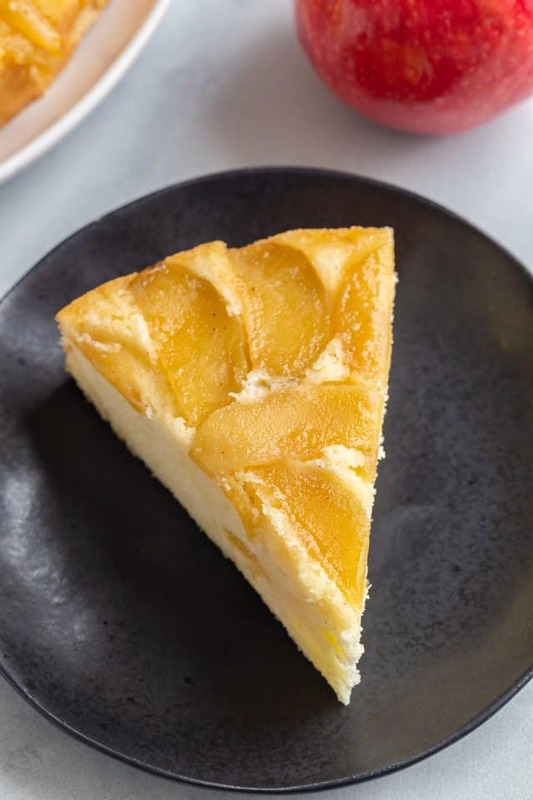 How to make apple cake? 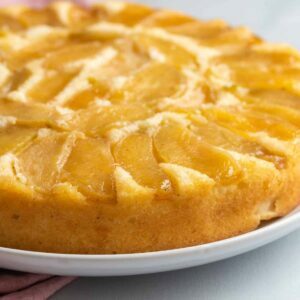 Cooking the apples first will bring out their flavor and reduce the juices that could make the cake soggy. 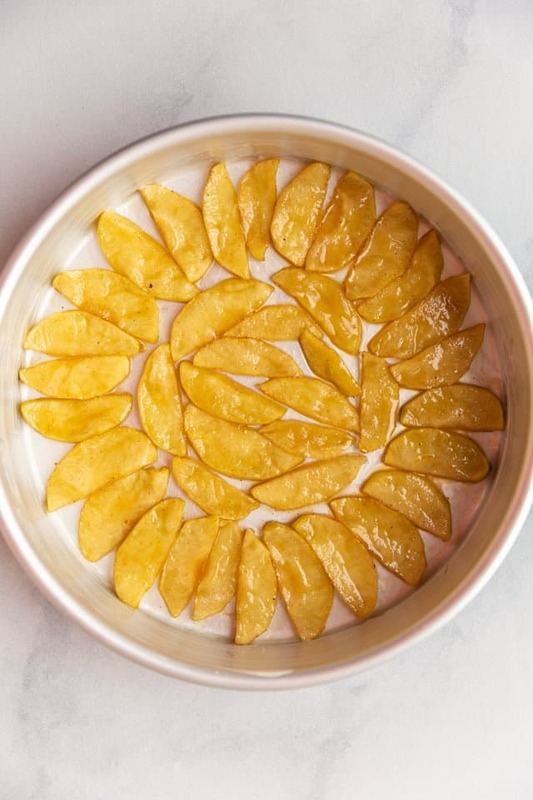 Once the apples are tender, arrange them in the bottom a round cake pan but leave the juices behind. I suggest lining the bottom of the pan with parchment paper so the apples don’t stick. The cake is a basic sour cream cake with loads of fresh chopped apples. I mixed all the wet ingredients together first then mixed the dry ingredients and combined the two. Once combined, fold in the chopped apple. 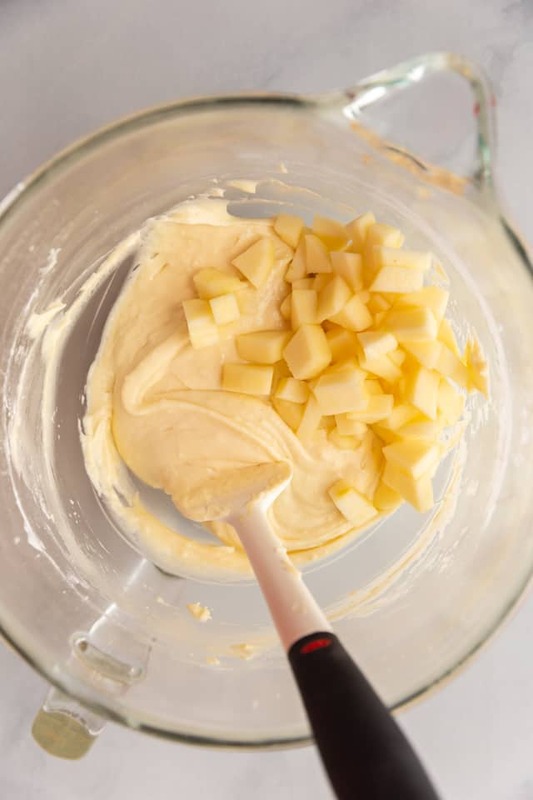 Spread the batter over the apples in the cake pan and bake it for 25-30 minutes. Use a toothpick to check for doneness. It should come out with only a few moist crumbs attached. Cool the cake in the pan for 5-10 minutes then invert it onto a serving platter. If you lined the pan with parchment paper the cake should release easily. 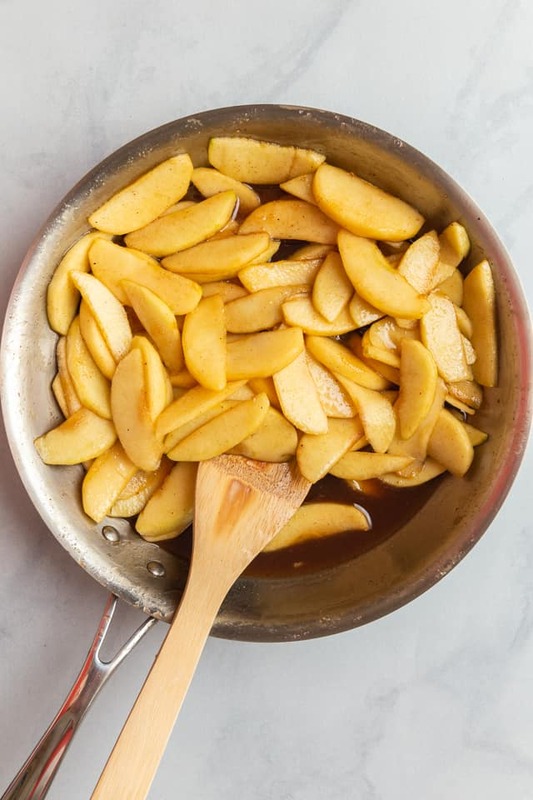 Take the extra step to line the bottom of the pan with parchment paper to prevent the apples from sticking. Granny Smith apples are perfect for this recipe. They hold up during baking and offer a lovely tartness to balance the sweet syrup and cake. Melt the butter in a large skillet over medium heat. Add the sugar, cinnamon, and nutmeg and stir to combine. Cook for about 4 minutes, until the sugar has turned dark brown. Swirl the pan occasionally. Add the apples and stir to coat. Cook, stirring occasionally, for about 5 minutes, until the apples have softened and the juices have thickened to a syrup consistency. In a large bowl, beat the butter and sugar together until light and fluffy, about 5 minutes. Add the eggs, one at a time, mixing well after each addition. Beat in the sour cream and vanilla. Combine the flour, baking powder, baking soda, and salt in a medium bowl. Stir with a whisk and add it to the butter. Mix just until the flour is fully incorporated. Gently fold in the chopped apple. Spoon the batter over the apples in the cake pan and spread the batter out into a smooth layer to the edge of the pan. Bake for 25 to 35 minutes, or until the cake is a rich golden brown and a wooden toothpick inserted into the center comes out clean. Cool on a wire rack for 5 minutes. Place a serving platter over the top of the cake pan and flip them both over to invert the cake out onto the platter. Don’t force the cake loose, let it sit for a minute if it’s not coming out easily and it will gradually detach from the pan. Cool to room temperature before slicing and serving. The baked and cooled cake will keep for up to 5 days covered tightly and stored in the refrigerator. The cake can also be frozen for up to 3 months. Bring to room temperature before serving. There will be leftover syrup from cooking the apples. 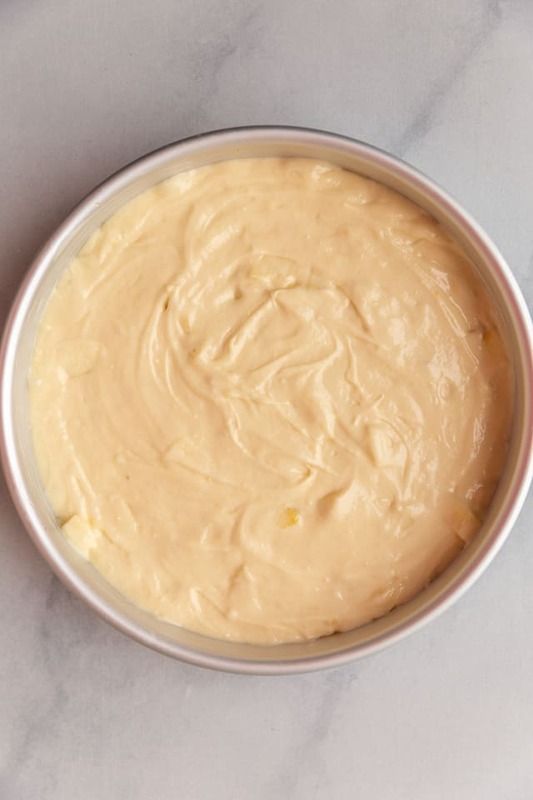 You can drizzle this over the baked cake or save it for pancakes and waffles. Store it in the refrigerator for up to 5 days.